Season the pieces of lamb shoulder with salt and black pepper, to taste. In a small bowl mix the chili powder, ground cumin and ground cloves. Season the lamb with the chili powder mix. Put the meat in a slow cooker; add the onion, garlic and coriander. Cover and cook on low for 6-8 hours or until the meat is tender and can be easily pulled apart. Turn off the cooker and shred the meat. Heat the pinto beans (optional) in a small pot. Heat the tortillas on a comal (griddle) or in a non-stick pan over medium heat until soft. To serve the tacos, put a little shredded lamb in the center of each tortilla. 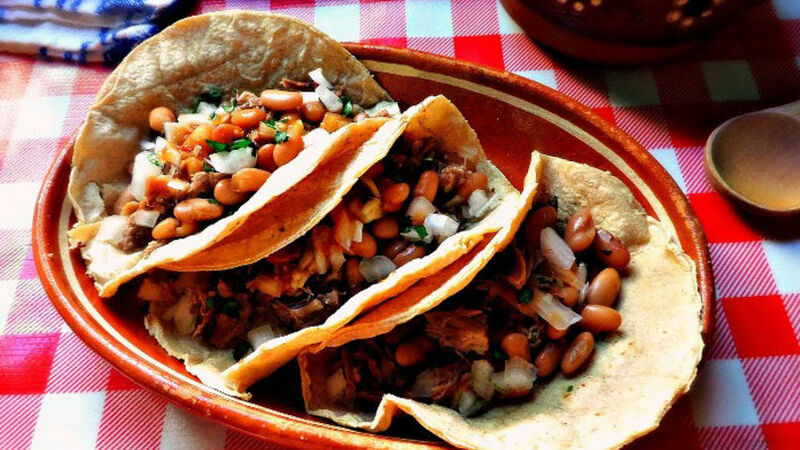 Garnish the tacos with the cooked beans, chopped purple onion, coriander and your favorite salsa. Enjoy! You can use this same recipe to prepare beef or pork tacos, swapping out the lamb for other meats. Lamb is a delicious dinner option. If you've never prepared it, this is a good recipe to get you started, because who doesn't like tacos? Cooking lamb in a slow cooker is a surefire way to prepare tender and juicy meat, ideal for stuffing tacos. Now sprinkle in spices like chili powder and ground cumin, and these tacos are nothing short of flavorful. After you try these tacos, your family will want every day to be Taco Tuesday.